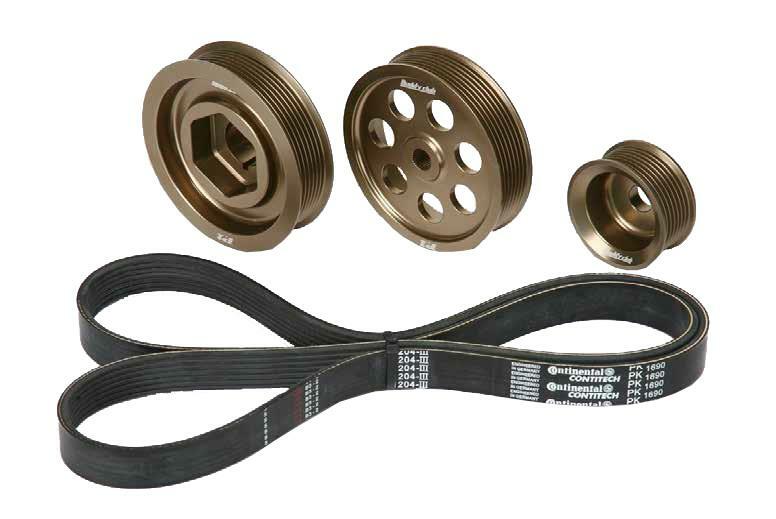 Buddy Club Racing Spec Pulley Kit - Pann Auto Performance - San Diego largest aftermarket automotive performance parts - What do you drive? Buddy Club has just released their new P1 Racing Crank Pulley Kit for the Honda K-series engines. Honda K-series engines love to rev, and you can free your engine to rev more quickly with the Buddy Club P1 Racing Pulley Kit. By reducing rotational mass and adjusting the pulley size ratio this kit offers improved acceleration, quicker throttle response and has been shown to free up an additional 8 HP and 7 ft-lb of torque in some race applications. Each kit is paired with a high quality 7-rib replacement belt. Pulleys are available individually as well as in pulley sets. Installation can be done by a knowledgeable do it yourselfer, but as always, Buddy Club strongly recommends a professional installation.